The globe is facing Energy stuff as a critical issue, especially in the wake of limitations of conventional power generation resources as well as their sustainability issues. A lot of research has been through and a considerable amount of money has been spent by this generation in search of some lucrative, viable and eco-friendly alternate energy solution. As carbon emissions in the environment are dreadfully high, governments across the world are strongly encouraging investments in renewable energy resources. Since, the future of energy sector is doubtlessly vibrant, moreover, the companies involved in the alternate energy zone especially Solar/Wind power part is brighter than any other sources. The basic reason is both the substance are free of cost and virtually everlasting. The conglomerates, which have the potential to effectively tap these profusely available natural resources, will do miracles in long term. I would like to light on few companies in both the above sectors. As first, I wish to introduce some companies involved in the Solar Energy sector. This sector is one of the high pace growing as well as investing in these companies may bring considerable returns in long term. Energy from the sun has many significant features, which includes widespread distribution, lack of pollution and a virtually inexhaustible supply. 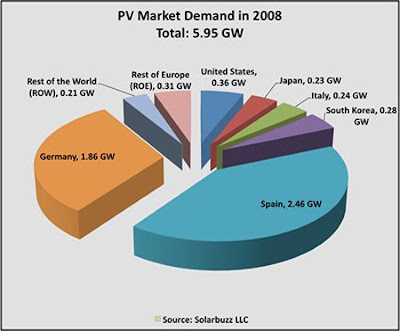 This is the driving force for international demand of Solar energy. Solar energy is also the most cost effective and reasonable power generation option for tomorrow with no moving parts, noiseless and zero emissions. Solar Market grew by 30% over in the last 18 years. The market is expected to grow from $15.6 Billion in 2006 to $69.3 Billion by 2015. The PV(Photo Voltaic) space is expected to grow five-fold to a global market size of Rs 300,000 crore ($70 billion) by Year 2015 as per Clean Edge Energy research. Solar thermal systems convert the radiant energy of the sun into heat and then use that heat energy as desired. The solar electric systems convert the radiant energy of the Sun straight into electrical energy which can then be used as most electrical energy is used today. Solar power systems are used for a vast range of residential, commercial and industrial applications. Webel Solar is one of the leading producers of Solar Photovotaic Cells and Modules in India. It is one of the fastest growing companies within the solar photovoltaic industry with a 30% annual growth. The company incorporated on Feb. 08, 1990, as a producer of solar photovoltaic cells and modules. The solar panels carry a warranty of 15-25 years with the product portfolio comprising modules applicable for various commercial and industrial applications. In 2006-2007, the company received certification for 100% of its products from ISPRA, IEC, UL-TUV and PV-GAP, all reputed international certifying agencies. The manufacturing unit is located at the Salt Lake Electronic Complex in Kolkota. The company extended its presence to 20 countries to de-risk from regulatory changes in any geography. Products are exported to USA, Europe, and Asian countries like China and Korea. Going forward, the company expects to enhance capacity from 42 MW to 72 MW in 2009-2010 and 102 MW by 2010-2011. Webel is an established player in this industry with a track record of over 10 years. Its products are well accepted globally. Webel-SL Energy Systems Ltd is investing around 1.8 billion rupees ($35.7 million) to build a second factory in eastern India to manufacture solar photovoltaic cells as it seeks to tap into rising global demand for clean energy. Webel-SL now generates about 95% of its total sales from exports to the U.S., Europe and Australia, But the company is witnessing rising local demand, helped by an escalating focus on renewable energy in the country. The products of the company are 10%-15% cheaper than the Europian/Chinese peers which help them to compete. 2. XL Telecom & Energy Ltd.
XL Telecom & Energy the ISO 9001:2000 certified company operates through its business strategic units of telecom, solar photovoltaic systems and ethanol. It offers CDMA mobile handsets, fixed wireless phones, SMPS power systems, Solar photovoltaic power plants, SPV home and street lighting systems, solar lanterns, outside plant accessories like jointing kits, optic fiber accessories and ethanol. XL Telecom is one of the leading Indian manufacturers of Solar Photovoltaic Modules, established in 1992. XL has over 15 years of experience of manufacturing Solar Photovoltaic Modules and systems to various agencies in India. The company has a solar photovoltaic cell manufacturing plant with a capacity of 120 MW per annum. It has a three-year exclusive distribution agreement with Forta Im Ex SL, Italy to deliver a minimum of 3 MW solar modules per annum. The company is in process to increase the capacity at its Hyderabad solar modules facility, spending up to Rs1100 crore in the next five-six years. As a beginning, XL plans to take up a Rs.305 crore expansion plan to set up a solar photovoltaic (SPV) cell facility with an annual capacity of 120MW on the city’s outskirts. This is the largest capacity in the SPV cells manufacturing in the country so far. The company, is now projecting a turnover of Rs650 crore for fiscal 2008, with Rs350 crore coming from the telecom division, Rs210 crore from solar modules and Rs90 crore from ethanol division. XL’s order book stands around Rs 600 crore, and about half of it comes for SPV products. XL Telecom’s Solar Photovoltaic Modules for Indian Market have the approvals of Solar Energy Centre (SEC), Ministry of Non-Conventional Energy Sources (MNES), New Delhi, Department of Telecom (DOT), Ministry of Railway and Ministry of Defence. Saptashva Solar S.A. is a Spanish based Company promoted by XL Telecom & Energy Ltd, as a subsidiary, to focus on Alternative Energy Power Generation. The company has experience in establishment of Photovoltaic (PV) Farms and supportive infrastructure with commercial and utility-scale projects across India and certain European Countries. These solar farms are designed and created to benefit the wider community as the power it generates is fed into the local electricity grid. Saptashva is also working to establish similar Solar Power Generating farms in other European Union countries mostly Italy, where it has signed letter of intent to obtain 200 MW worth Solar Power Projects and is working to launch the same. Its immediate objective is to establish about 300 MW Solar Power Farms in Spain and Italy by 2010 and medium term objective is to create 1,000 MW Solar Power Generating farms globally. Saptashva has acquired its first Solar PV project in Majorca, Spain in 2008 with initial capacity of 1.6 MW. The Solar Farm is spread over 3 Hectares of Land located in Majorca and is already generating the Power and connected to the Grid. The total cost of the project is about Euro 10.3 Million and has been funded currently with own funds and suppliers credit. Saptashva has obtained rights to implement its Solar PV project in Tarquinia (Lazio), Italy in 2009 with initial total capacity of 25 MW (1MW farms of 25 Nos in one location). The Solar Farm is spread over 60 Hectares of Land located in Tarquinia and is currently in System Design stage. The total cost Euro 100 Million. Saptashva has acquired rights to execute its Solar PV project in Soleto (Apulia), Italy in 2009 with a preliminary capacity of 10 MW (1MW farms of 10 Nos in one location). The Solar Farm is spread over 38 Hectares of Land located in Soleto, Apulia and is currently in System Design stage. The project should initiate in Second half of 2009.. The total cost Euro 45 Million. Saptashva has achieved rights to establish its Solar PV project in Gravina (Apulia 2), Italy in 2009 with initial total capacity of 9 MW (1MW farms of 9 Nos in one location). The Solar Farm is spread over 39 Hectares of Land located in Gravina, Apulia and is currently in System Design stage. The project should initiate in second half of 2009.. The total cost of the project is about Euro 40 Million. 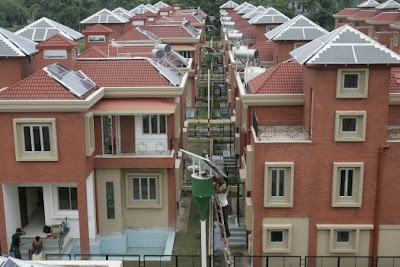 Moser Baer Photovoltaic (New Delhi) is a subsidiary of Moser Baer India Limited. It is in the business of manufacturing photovoltaic (PV) cells and modules. MBPV manufactures solar cells and modules by spanning multiple technologies including crystalline silicon, concentration, and thin films. The company at present has production lines in crystalline silicon cell manufacturing and thin film located in Greater Noida in the National Capital Region. A thin film PV plant near Chennai with a projected 500MW annualized capacity is also being set up. The parent company, Moser Baer, is a leading global technology company. Established in 1983, it is the world’s second largest manufacturer of optical storage media like CDs/DVDs as well as high capacity new generation optical storage medias like HD-DVD and Blu-ray disks. The company has in recent years transformed itself from a single business into a multi-technology organization, diversifying into exciting areas of solar energy, home entertainment and consumer electronics. 80 MW, fully automated in-line crystalline silicon cell manufacturing facility which can be scaled up to 240 MW. A 40 MW module manufacturing facility with expansion plans to scale it up to 200 MW. A high concentrator photovoltaic (CPV) module manufacturing facility and multi-million dollar investments in a US-based company - Solfocus, the developer of the CPV technology in partnership with the world prominent Palo Alto Research Center (PARC), California. A major equity stake in Solaria, a US-based technology group that has developed a unique form of low-concentration solar PV technology. It is proficient in producing power equivalent to two to three times the power produced by conventional PV modules, using the same amount of silicon material. A significant minority stake in Stion Corporation, a nanostructures development company based in the Silicon Valley, California, for producing extremely low-cost solar power generating surfaces. Acquisition of 40% equity stake in Solarvaiue, Proizvodnja d.d, a solar grade silicon production facility in Slovenia, to provide access and assurance of supply to low-cost solar grade silicon. An R&D centre dedicated for the improvement and rapid commercialization of solar technology products. In addition to the above, MBPV has invested in strategic partnerships connecting the entire value chain, particularly for raw material supply sources such as silicon ingots and wafers, glass, etc. through short-term and long-term supply agreements. Moser Baer modules are suitable for residential, commercial and industrial purposes. The modules uses high efficiency Multi/Mono Crystalline silicon solar cells of high transmittance, low iron content, tempered and toughened glass and premium quality encapsulation materials like EVA and Tedlar. MBPV recently achieved a contract from Roads and Buildings Department of Gujarat to set up one of India’s largest roof-top solar photovoltaic (SPV) installations in Surat. The SPV system, of approximately 135 Kilowatt-Peak (kWp) installed capacities, will run a 40kW load for 10 hours every day and will charge a battery bank of 6,000 ampere hours. Work on the mission is in final stage and the company will also deal with the operations and maintenance of this site for seven years. This project is in line with the Gujarat government’s focus on clean and renewable energy in the state. Hope we will have more other visionary CMs like Modi. MBPV offers customized grid-hybrid, off-grid and power back-up solutions for a number of applications like building rooftops, telecom towers, banks and ATMs, rural electrification, water pumping, etc. Its systems are specifically designed for reducing the load on diesel generators or even totally eliminating them, thereby helping customers achieve breakeven on their investments within a reasonable time-frame. After achieving breakeven users get almost free power for the rest of the life of the system, which typically is between 10 to 15 years. In addition, MBPV views large solar farms as one of its key growth drivers and has a special wing to provide turnkey services for such farms. The Sun is the most powerful source of energy available to mankind all over the earth. The Sun is supplying 10,000 times the amount of energy needed every year by Earth. There is no need of any apprehension on this source of power supply as the Earth will survive only if Sun exists. I think, its the reason, Sun was treated as God in the Vedic era. But, all of us have to treat him as a real GOD in near future cause of his role as an eternal power generator. Investing in the above scrips with a patience of 5-7 years may definitely make good returns, but its also significant to keep a close watch on the company activities. I am not responsible for your investment decisions. Please do your own analysis before any investment. I would like to list out the first batch of Penny Stocks as I mentioned in one of my previous post. We also had a discussion on some unethical activities occurs behind the screen in such scrips at Mr Kumaran's blog. I wish to request the readers to go through the following article before planning any investment in Penny Sctocks. On the other side, a few number of such stocks have always turned out to be multibaggers from the bear markets or in any stage of the bull runs. But locating such srcips are almost impossible in the earlier stages because the Technical/Fundamental figures even looks very much weaken, the reason I skipped the technicals. A close observation on such companies may help you out to assume the future prospective of the business they involved. It is also significant, you should prepare for a high risk level in the case of any negative results. Shortly, Investors should more cautious in buying penny stocks cause of the higher risk rate. 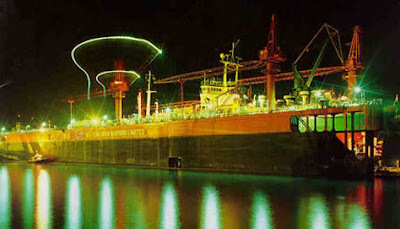 Western India Shipyard Limited (WISL), India’s largest composite ship & rig repair facility in the private sector. It is one of the world’s advanced multi-dimensional and multi-purpose yard offering modern, streamlined and sophisticated ship & rig repair facilities and services. WISL’s Floating Dry Dock has a capacity to repair ships up to 60,000dwt and to accommodate ships up to 225m. length and 32.5m. in breadth. The company has already been proved its competence in repairing a vast range of domestic/foreign vessels in an admirable manner. The yard has been designed and established in collaboration with world leaders in Ship Repairs. WISL is strategically located at Goa along the west coast of India at 15° 25' North and 73° 47' East and is geographically best positioned to offer a complete range of ship repair services. Evinix Accessories (EVINIX) is in the business of designing and manufacturing fashion accessories and garments for exports as well as domestic markets. The company offers products in two categories. Fashion accessories includes caps, hats and bandanas, sports bags, ladies fashion bags, soft travel bags, wallets, leather belts, fashion belts, coin purses, travel kits, gift giveaways, wraps, stoles, scarves and shawls, baby bibs, cribs blanket and beddings. Fashion apparels include kidswear like trousers and tops (denim and non denim) and women`s wear like tops and dresses. The company also undertakes bulk trading of processed and greigh fabrics. Two plants including a 100% export oriented unit in Faridabad, Haryana have in-house facilities for fabrication, washing and embroidery. The combined installed capacity for fashion accessories and garments is 2 million pieces. The capacity after ongoing expansion, including the unit at NSEZ, Noida, would be 3,000,000 garments and 3,500,000 accessories. The major buyer of products in the domestic markets includes Adidas India Marketing, Gokaldas India and Arvind Brands in Bangalore, V & S International Haryana. The company has entered into a licensing and sales agreement for caps and bags in the Gini & Jony brand. Overseas buyers include The GAP USA; Esprit Europe Trading & Product Development, Germany; Next Retail, UK; H & M Hennes & Mauritz, Sweden; Fashion Box Industries, Italy; and Debenhams Retail, UK. Some of the new international brands on this division’s client list include American Eagle (US), Cecil (Germany), Next (UK), Fun & Basics (Spain), along with domestic brands like Puma and Gant. Evinix has been adding new products and new buyers at a very rapid pace in the Fashion Accessories segment. The company employs more than 700 people in the manufacturing facilities and also has a management and administrative staff of 150 people. Cut StoresCUT, a MaBS (Many Brand Store), addresses the young audience between 16 and 35 years, and is a home to 61 global brands (Adidas, Puma, Kappa, 454, Purple Wine, Reebok, Lee, Levi's, Mercedes Benz, to name a fews). CUT is an acronym for Comfortable, Urban and Trendy. Evinix is setting up CUT stores (averaging 4000-5000 sq feet) in fast urbanizing young Indian towns. Company-owned and company managed, the CUT stores are brand selective and sell merchandise across the entire range of Apparel, Footwear and Accessories for young men and women. Strategically located on the high streets, close to universities and youth hang-outs, the stores boast of truly youthful and high spirited ambiance. Marksans was incorporated in 2001 as a wholly owned subsidiary of Glenmark Pharmaceuticals Ltd. In the year 2005, an alignment pact of Marksans Pharma Ltd with Tasc Pharmaceuticals Ltd resulting in a creation of new entity: Marksans Pharma Ltd. With this successful integration the company has become an integrated player for both pharmaceuticals (based on chemical substances) and biopharmaceuticals. Marksans Pharma, Headquartered in Mumbai (India) is vertically integrated global player with strong presence across the entire value chain from Active Pharmaceuticals Ingredient's (APIs) to formulations to biopharmaceuticals. The company is also actively engaged in R&D and offers Contract Research and Manufacturing Services (CRAMS) to global pharmaceutical companies. The specialty focus of Marksans Pharma spanning in the medical fields of Oncology, Gastroenterology, Antidiabetic, Cardiovascular, Pain Management, Gynaecology and others. Furthermore, Marksans also inroads into complex and intricate markets dealing with Biotechnology and Neuro-psychiatry. Manufacturing plants are built as per US FDA guidelines and approved by recognized UK MHRA, Australia TGA and Brazilian ANVISA health authorities and the products are supplied to more than 54 countries. The company has received a certificate of suitability for Metformin Hydrochloride drug substance from the European Directorate for the Quality of Medicines and Healthcare (EDQM). 52W Low/High - 03.00/17.50Birla Cotsyn (India) is engaged in cotton ginning, pressing and oil expelling. It was converted into a public limited company with effect from May 30, 2006 and is part of the Yash Birla group. The company has its units located in Khamgaon, Ghatanji and Dhulia. The textile project at Malkapur has been granted the mega project status by the Maharashtra government and will get fiscal benefits over the next 5 years. As part of phase II of its expansions plans, the company will manufacture finished cloth with an installed capacity of 50,000 meters per day by setting up a dyeing and processing unit. In addition to the current expansion plans, it plans to start manufacturing its own branded garments in 2009 and has put up around 20 retail outlets across major cities in the country. I am not responsible for your investment decisions, Please do your own research before investment in any of the above srips.